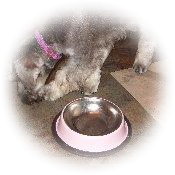 To get you started the Tialexi Miniature Schnauzer Puppy Pack has enough food for the first 10 to 14 days. 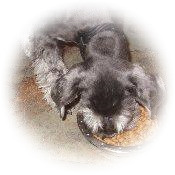 In the early weeks the food ration for your puppy is split into 4 meals daily. When your puppy reaches 16 weeks old, this should be reduced to 3 times daily. 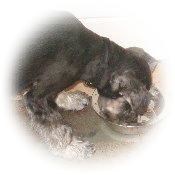 To avoid getting into a grazing eating routine, never leave your puppy's food down for more than fifteen minutes, take it away and just add whatever is left to the next meal of the day. Fresh water should also always be made available. It is our practice to give cooled boiled water at all times to the puppies when they are with us, and we recommend you continue this routine for a short time while your puppy gets settled into your new home. Sometimes the change of environment can result in the puppy's motions becoming loose, in this event miss out 2 feeds or up to 24 hours. Make sure cooled boiled water is made available at all times, and then re - introduce smaller quantities of food. When motions return to normal, recommence with the normal diet. Should the puppy become very lifeless or if the motion looseness continues for more than 48 hours then consult your veterinary surgeon.